At Ned Ludd An American Craft Kitchen restaurant in Portland, Ore., chef Jason French loves to prepare food in his wood-fired oven and outdoor smoker so much that he doesn't even have a gas stove. 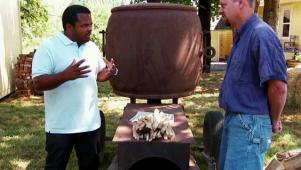 Jason takes Roger Mooking to Big Table Farm in Gaston where his friends built a smoker out of a sea buoy. Chickens and pork belly are smoked for a sunset feast in the middle of the farm. 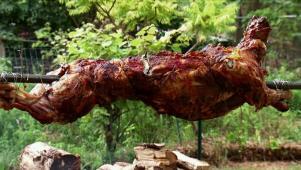 In Iowa City, chef Kurt Friese hosts "Lambapalooza," whole lamb cooked on a rotisserie he built in his backyard. Lamb from a local farm is stuffed with aromatics and cooked throughout the day and potatoes harvested that morning are baked directly in the coals. 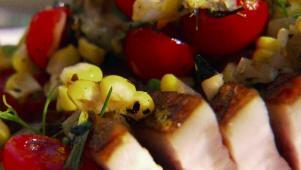 Roger learns the secret to making smoked chicken slaw for a backyard feast.